These Ham, Cheese and Mustard Scrolls are a hit in our house! They are great for lunch boxes, freezer friendly and can also be made using a Thermomix too. For a simple lunchbox recipe, you can’t go wrong with these yeast free Ham, Cheese and Mustard Scrolls. The dough recipe for these scrolls is the same one that I use for our Vegemite and Cheese Scrolls, Hawaiian Pizza Scrolls and of course our favourite sweet scrolls – Cinnamon Scrolls. It’s certainly not a traditional dough recipe, but it’s easy to work, you can add practically whatever scroll filling you like, and best of all, the kids love it! 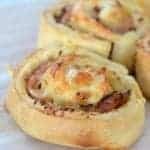 When making these Ham, Cheese and Mustard Scrolls, if you are finding your dough is quite soft to work with (which can happen if it’s quite warm when you are putting these scrolls together), just pop it into the fridge for 20 minutes or so to chill and it will become firmer and easier to work with. Once cooked, these scrolls can be frozen for up to two months, just pop them into a freezer safe container. If you are making these Ham, Cheese and Mustard Scrolls for adults (or older kids) you can also add an extra tablespoon or two of seeded mustard to give them a little extra kick, however for the kids, I’d suggest sticking to three tablespoons. For more easy lunchbox snacks, make sure you check out our Tasty Tummies Healthy Snacks and ThermoBliss Lunchbox Snacks book – also available as a bundle. These Ham Cheese and Mustard Scrolls are such an easy lunchbox recipe! Both regular and Thermomix instructions included. 2 cups self raising flour Plus extra to dust your bench with. Preheat your oven to 210 degrees (fan-forced) and line a tray with baking paper. Sift the self raising flour and salt together in a large bowl and rub in the butter until the mixture is the consistency of bread crumbs. Slowly add the milk and use a butter knife to combine. Tip the dough out onto a bench and lightly knead until it forms a smooth ball. Use a rolling pin to roll dough out until you have a 30 x 40cm rectangle - approximately. Spread the butter and mustard over the dough, making sure to leave a 2cm gap around the edges. Brush one long edge with a little milk. Cut into 12 slices – approximately 2cm thick and place on a baking tray and sprinkle with the extra grated cheese. Once cooked, these Ham, Cheese and Mustard Scrolls can be frozen. Store in a freezer friendly container and pop them into your fridge or place on the kitchen bench to defrost. These easy Thermomix Ham, Cheese and Mustard Scrolls are such an easy lunchbox recipe! Both regular and Thermomix instructions included. 300 grams self raising flour Plus extra to dust your bench with. Place the flour, butter and salt into the Thermomix bowl and mix for 10 seconds on speed 9 until mixture is the same consistency as bread crumbs. Add the milk and mix for 7 seconds on speed 4 to combine. Turn the dough out onto a floured bench and using a rolling pin, roll the dough out until you have a 30cm x 40cm rectangle. Can you use ready pastry from supermarket and if so what pastry do you buy.